At KSI Montenegro we strive to provide all our learners with a balanced, relevant, engaging and differentiated education to ensure the success of all our students. We support the development of independent lifelong learners. Our teachers seek to instil in learners attitudes of confidence and achievement, which when combined with a rigorous academic curriculum, opportunities for sports and artistic self-expression prepares learners to graduate to the most respected universities in the world. KSI Montenegro is an IB world school offering the International Baccalaureate curriculum for children aged 3-18. The programme encourages both personal and academic achievement, challenging students to excel in their studies and take their learning beyond academic studies, being active in their communities. English is the primary language of instruction whilst providing lessons to support the learning of Montenegrin, the host country language, enables our learners to develop better cultural understanding and integrate into the Montenegrin community. A third language and/or mother tongue language support is also offered to support our school’s mission of enabling learners to engage productively and creatively in a global environment. French and German are also offered as part of the curriculum. 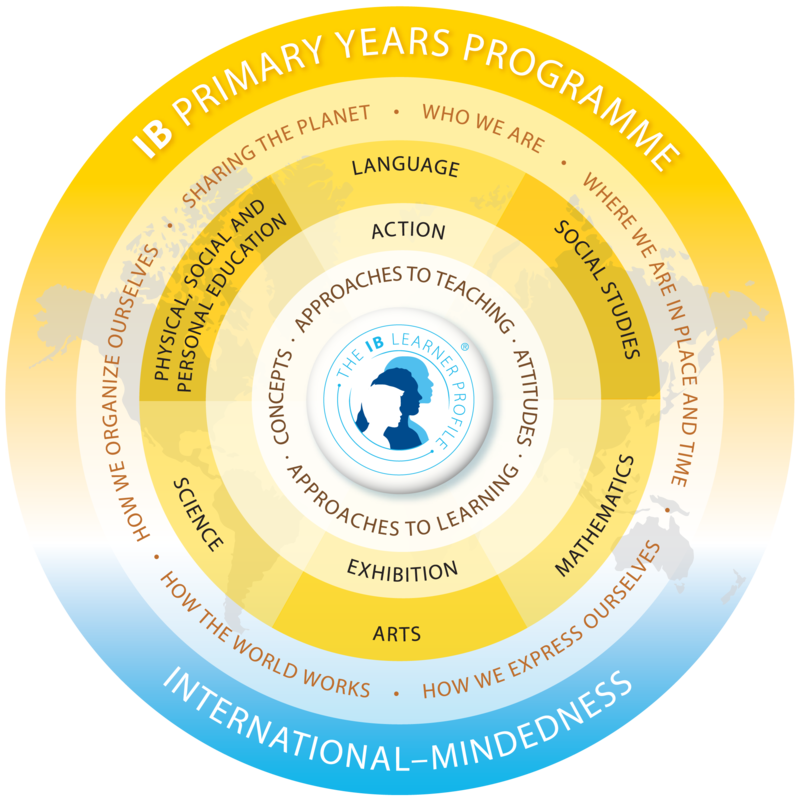 What are the six subject areas identified within the PYP? What are the six transdisciplinary themes of the PYP? The themes allow teachers to incorporate local and global issues into the units of inquiry and support children’s learning outside of the confines of learning within just subject areas. Each theme or Unit of Inquiry lasts approximately 6 weeks for Years 1 through 6 and 9 weeks for Kinder classes. Students are continuously assessed by their teachers throughout the unit of inquiry but also receive a formalised end of unit assessment to record their progress of subject specific knowledge, understanding the central idea and learner goals. Assessments particularly focus on mathematics and literacy development. To help measure progress, children will take MAP assessment tests 3 times a year, to monitor their growth and ensure any “needs” are highlighted in Mathematics or English. For more information on MAP assessments please speak to the school or visit the NWEA website. The MYP is designed for students aged 11 to 16. It provides a framework of learning which encourages students to become creative, critical and reflective thinkers. 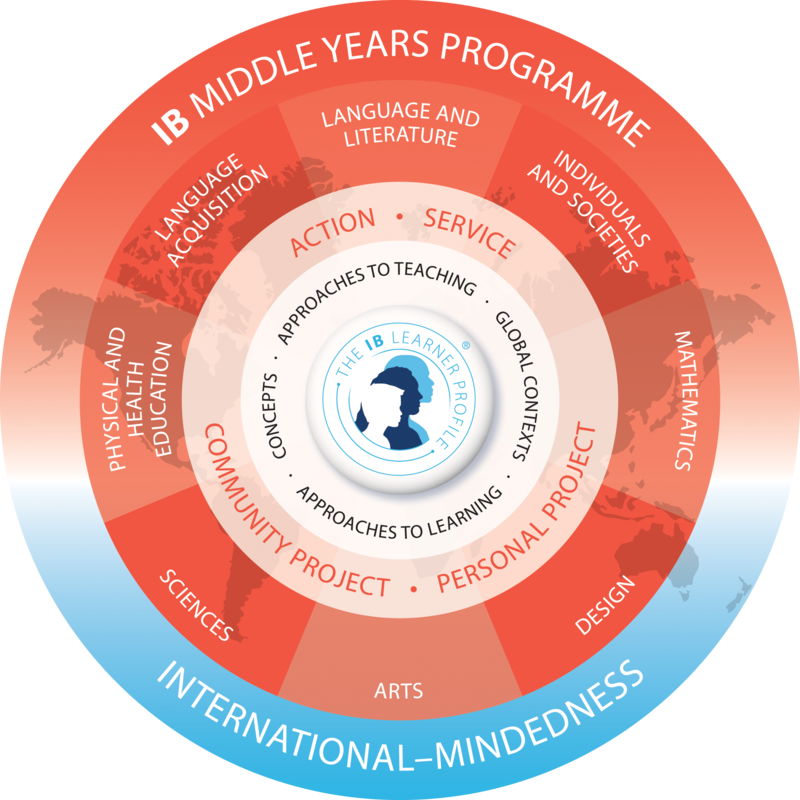 The MYP emphasises intellectual challenge, encouraging students to make connections between their studies in traditional subjects and to the real world. It fosters the development of skills for communication, intercultural understanding and global engagement. The MYP is a disciplinary and interdisciplinary curriculum, which consists of eight subject groups. Subject teachers provide a global context for teaching and learning, and develop conceptual understanding within their own discipline and across subject groups. Students are required to study at least two languages (as part of their multilingual profile and also to develop their intercultural understanding), individuals and societies, sciences, mathematics, arts, physical and health education, and design. These subjects are unified by their focus on skills that help students learn how to learn, and their promotion of service as action. In Year 10, students will undertake a small group ‘community project’ to explore their right and responsibility to implement service as action in the community. This will help to prepare them for their final year, during which students will undertake an independent ‘personal project’ to summatively demonstrate the development of their skills and understanding to this point. What are the eight subject areas identified within the MYP? The MYP is a disciplinary and interdisciplinary curriculum. Subject teachers provide a global context for teaching and learning, and develop conceptual understanding within their own discipline and across subject groups. MYP assessment standards are consistent around the world and are a criterion-related assessment model. Our teachers structure varied continuous assessment tasks so that learners can demonstrate achievement according to the objectives defined by the IB. Tasks are assessed against established criteria, not against the work of other students. Students will also continue to sit the MAP assessment tests 3 times a year to assess their progress in Mathematics and English. The DP is designed for students aged 16-18. It is an academically challenging and balanced programme of education with final examinations. It is aimed at preparing students for success at university and life beyond. The programme has gained recognition and respect from the world’s leading universities. It has been designed to address the intellectual, social, emotional and physical well-being of students. 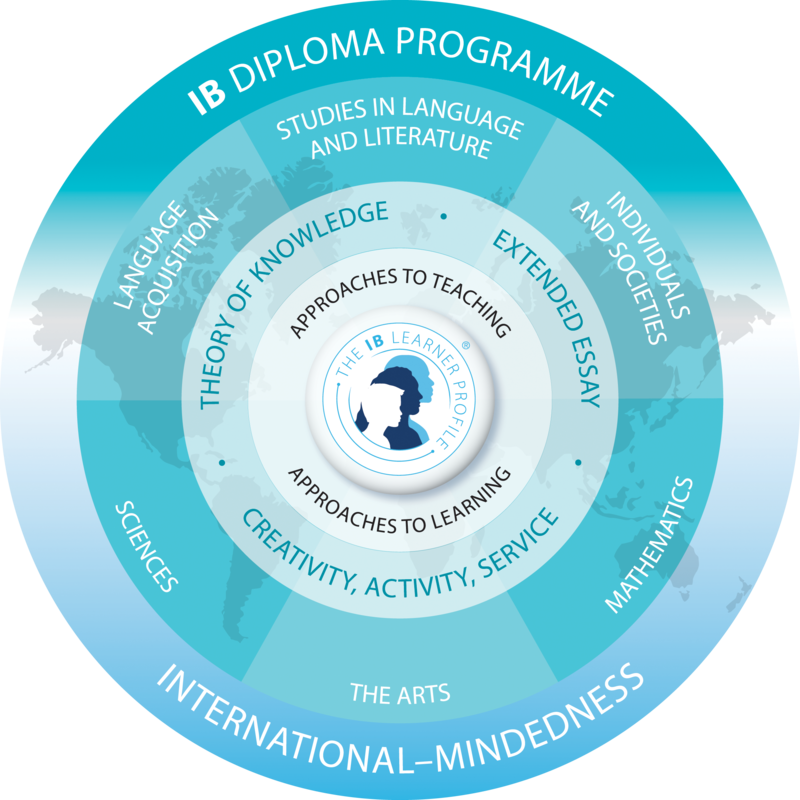 IB Diploma Programme students must choose one subject from each of five groups (1 to 5), ensuring breadth of knowledge and understanding in their best language, additional language(s), the social sciences, the experimental sciences and mathematics. Student may choose either an arts subject from group 6, or a second subject from groups 1 to 5. There are different courses within each subject group. The extended essay: This asks students to engage in independent research through an in-depth study of a question relating to one of the DP subjects they are studying. The world studies extended essay option allows students to focus on a topic of global significance which they examine through the lens of at least two DP subjects. Theory of knowledge: This develops a coherent approach to learning that unifies the academic disciplines. In this course on critical thinking, students inquire into the nature of knowing and deepen their understanding of knowledge as a human construction. Creativity, action, service (CAS): This involves students in a range of activities alongside their academic studies throughout the Diploma Programme. Creativity encourages students to engage in the arts and creative thinking. Action seeks to develop a healthy lifestyle through physical activity. Service with the community offers a vehicle for a new learning with academic value. The three strands of CAS enhance students’ personal and interpersonal development through experiential learning and enable journeys of self-discovery.